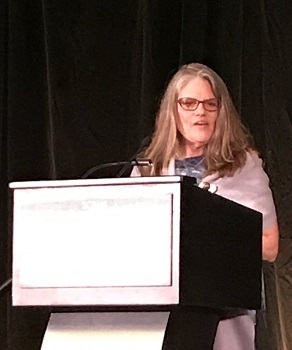 Accepting the SCBWI’s Golden Kite Award for Vincent & Theo. JOIN THE SOCIETY OF CHILDREN’S BOOK WRITERS AND ILLUSTRATORS. Find them at scbwi.org. WRITE AND REWRITE AND REWRITE. Writing is all in revision. READ WHAT YOU’VE WRITTEN OUT LOUD. To yourself, to others, and best of all, to a writers group. You notice so much more when you read aloud. MAKE CONTACTS AT CONFERENCES WITH EDITORS AND AGENTS. NEVER EVER EVER TELL AN EDITOR THAT YOU READ IT TO YOUR GRANDCHILDREN (or your children or your students) AND THEY LOVED IT. Your grandchildren et al would love it if you read them the phone book. JOIN A WRITERS GROUP. Learn to take critiquing. Learn to critique and read critically. NEXT WHEN IT GETS REJECTED. PERSIST. You can do it if you really want it, and if you work really hard. Write regularly, do writing exercises, train as if you were training for a marathon. You are.